In contrast to what you saw on twitter, I saw this. Don’t forget the number of former employees (who either left of their own volition or were terminated) who had their summit invitations revoked by the head of Mozilla HR. Great way to keep folks involved! There is a Mozilla Alumni group … on Facebook. Organized by Mozilla Alumni. While it’s not quite as dire (and the Twitterer in question was just making an ill-phrased joke) as it could be, it’s certainly not great. For this particular Summit, applications to receive invitations were sent through the Mozillians email list, and many people I know don’t read those communiques (a broader problem: how as a Mozillian should I try to stay involved?) or didn’t expect that to be the process by which they would receive an invite to the event. A definite pity. The thing I find most frustrating is that having now worked for a couple of startups, there is a lot of great data and feedback I’d like to share with Mozilla about things like mobile, apps, etc. I’d also love to be a strong advocate for them. I feel, however, like any attempts I make to do so are met with initial enthusiasm and then poor follow up. I’m left wondering how best to contribute, when my contribution is not purely code based. Some people may argue that this, in particular, is the problem, and not a new one. I totally agree that a small amount of the community team’s time dedicated to providing great support for alumni would be fantastic. I know, first hand!, that we are some of the most effective evangelists for Mozilla. Hey, that tweet made me uncomfortable too (even if it was in jest) so thank you for calling it out and writing this. I’m not sure if I agree with your broader conclusions, though. For one thing, a number of former staff did come to at least visit during part of the summit and were welcome in discussions there (including some now at Facebook, like my former teammate Frank Yan). But none of the ex-employees that I’ve personally worked with are really engaged with the Mozilla project anymore. 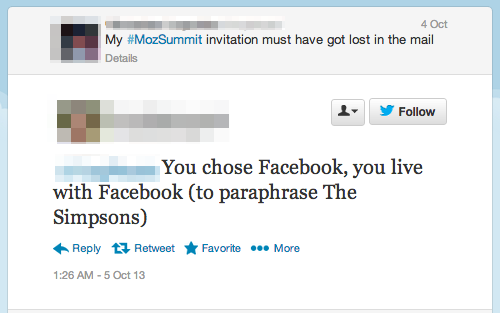 (Those who are can opt in to communications like summit invitations in the same way all our community can.) That’s their choice to make, and I absolutely don’t fault them for it. People burn out or become otherwise dissatisfied, or just need to focus on their new thing for a while. But since the summit has a limited amount of space and we already need to turn away some community members who would like to attend, we *should* prioritize people who are active in the project now over people who were in the past. That’s not to dismiss the value that alumni bring to an organization even after they disengage. I’ve stepped down from several companies and open source projects in the past. Being part of the alumni network for each of those groups benefits both me and the group. I can provide links between my old colleagues and new ones, and evangelize ideas and products (as Beltzner mentioned). But in my new role as an outsider with ties to a group (rather than a current member of the group) I no longer expect to be invited to the yearly off-site or company picnic or whatnot. So I agree we should value and strengthen ties with alumni whether they remain active contributors or not, but I think the expectations are different for the two cases. And Beltzner is right that there are many ways we fail to engage properly with non-full-time contributors in many areas; I’m one of those who would argue this is a general failing that extends beyond former paid staff. Yeah. I wanted to chime in and say about the same thing. I don’t know if the former-empolyees know, but there are plenty of people who are very VERY active contributers to the project right now, working more than a few hours every night on stuff, who weren’t invited as well (in the cases I know about, the timing was off between when they started contributing and when summit invites were sent). i.e. you weren’t alone in not getting invites, and it wasn’t an intentional slight. Just prioritizing people who were especially active at the moment invites were being sent out. Thems the logistics for an org thats much much larger than just its paid staff. At least, that’s how I took/explained it to my active contributers. This is a very valuable conversation to have. I don’t want to pick on the twitter thread in here, since for one I posted on it :) and also I thought it was clear that it was a joke between friends, and that we were sad the person in question didn’t get invited and thought they should come anyway. I am afraid that this is going to cause hurt feelings where there shouldn’t be any, and that’d be unfortunate because we need to have this dialogue. I’ve been a contributor, then staff, then a contributor, and then staff again – so I think I have some perspective of both sides here. I have primarily contributed on the code and devops sides (I helped get tinderbox up when it fell down and helped with code for it’s replacement, as a contributor, to give a concrete example). I have also done some big-picture thinking (with prototypes!) as a contributor, and made a lot of noise and pinged people about it. My personal experience is that many teams are very busy and in some form of crisis mode pretty much all the time, and were very receptive to the former and enthusiastic but didn’t have time or energy to follow up on the latter, much to my chagrin. I also wasn’t privy to a lot of the project-wide thinking and priorities, not because they are secret so much as because I didn’t have time to call into meetings and try to keep up with that sort of thing. Whether I got invited to events or not largely seemed to be related to how recently I had helped out, and also just random expressions of interest in such things while out to lunch/dinner with at-the-time former co-workers. I think the process is more formal now but I think it’s pretty hard to define “active contribution”. It’s unfortunate that (based on admittedly anecdotal, but looking at other comments here, corroborated data), it’s probably worse than that: Mozilla’s actions over the past few years, both organizationally and through its director-level-and-above management have not only alienated people, they’ve actually turned alumnis into something between apathetic and detractors. I don’t know how you tackle this, but current employees giving public presentations and tech talks denigrating the work of Mozillians who came before them is likely a good place to start. There is tension here, whether officially recognized or not. I admit to feeling a spectrum of emotions when I first read the tweet in question, and I certainly heard mixed reactions when I talked to various people at the Summit about this. People move on for a myriad of reasons, but some people also choose to stay with Mozilla. I miss my friends who have moved on, but how much influence do I want former employees to have on our mission, something that I’m still living and breathing every day? Petty on my part, perhaps, but that’s how I feel. What I’m hearing from this conversation is that alumni have trouble plugging into process once the leave. What expectations should former employees have for engagement, especially if they once held positions of relative power and access within Mozilla? How should we be handling input from former thought leaders? How do we measure that contribution versus some other traditionally volunteer activity like e.g. l10n? I’d love to see my ex-Mozilla friends at the next Summit, but it really has to be for the *whole* Summit, and not just the parties. Mozilla needs to find a way to enable and value their ongoing contributions in such a way that inviting them to the next Summit is a no-brainer. agree wholeheartedly with the past paragraph. coop, I feel like the implication is that just because I’m not paid-staff that I don’t still “live and breath” the mission every day. I’d suggest that that’s what’s pretty powerful about Mozilla – as some have left paid-staff the Mission values go with them and into other work places. In the (Facebook) thread above, a (Facebook) event was created for Mozilla to “take over” Old Pro in Palo Alto. it doesn’t solve the problem. In certain ways, it exacerbates it. Christ on crackers, Paul, I’m using Facebook to invite people out for drinks so we can hang out together. Nobody other than you has used the words “mission accomplished,” or even suggested that this is a solution to the problem. It is, however, a more constructive step than simply denouncing the problem and any attempt at making things better. I kind of hope I don’t see you there if this is the attitude you’re going to bring. Please allow me, Mike, to put this as plainly as I possibly can: when you single out individuals who are true to their own experiences and express concerns about the exact issue raised in this post, and you choose to do so by trying to devalue their experience, discredit their character, and say things like “I kind of hope I don’t see you there if this [is what you’re actually feeling about the situation],” you are exemplifying the exact behavior that causes the problem described in this post. Maybe it’s unclear to you, but this behavior alienates people. And to clarify: I didn’t denounce the problem at all; in fact, I did the exact opposite, so I don’t know why you chose that word. I did denounce your proposed solution, because I don’t think it solves the problem. It looks to me to be an opportunity to hang out with the specific people referenced in the blurred-out tweets (thank you search.twitter.com), which… there’s nothing wrong with that, but again: it doesn’t solve the problem raised in this post. IIRC, while “join this mozillians.org group” was the way of asking to be considered for a Summit invite, it wasn’t the way the process was announced. It was announced in the Monday meeting on 1st April (did people think it was a joke? ;-), and on Mitchell’s blog and the community blog (and so on Planet). Also local communities were asked to go and encourage their members to apply. Perhaps it’s English-speaking bias here, but could it be that the reason several ex-Mozillians represented here didn’t even hear about it is that there’s not an “English-speaking Mozilla community” group in the same way that there’s one for French or German or Korean? One thing I want to explicitly note here is that individual instances of what’s meant (hoped?) to be “friends teasing” becomes something different when it’s part of a pattern. There’s been a lot of it, and when a group of people is the subject of the same joke for the 10th time, and/or from 20 different people, it’s time to stop. And from from talking with some Facebook employees at the summit, it was already pretty clear they’re quite tired of it, and it’s a disservice to both them and us. And so even though the particular tweet you happen to call out in this post didn’t have ill-intent and wasn’t (afaik) received that way, that’s not the point. It’s a problem to fix, and a fine place to start talking about the broader alumni topic. Communicating and especially listening in a sincere way with alumni seems like a good start – also http://www.mozilla.org/en-US/about/governance/policies/participation/ seems appropriate and might be helpful (and maybe revisit if we need to!) – conflicts arising from humor backfiring seems especially appropriate. Yeah, definitely this. I can be pretty direct when I talk in lots of technical discussions. But this sort of non-technical thing, I tend to be a bit more sensitive when talking. And the somewhat-restrained frustration in those “teasing” responses, while understandable, didn’t seem to be particularly helpful to me. People change. They move on. (If not always moving *fully* on.) Expecting equal involvement from everyone is never going to work, for lots of reasons. So yeah, thinking at least a little before joking, or even before expressing frustration however justified, seems good to me. I don’t know what the alumnis group on Facebook provides, but why is there a need for a mozilla alumnis group at all? As i see it, either you moved on, and an alumnis group is only ever going to help you keep contact with other people that moved on (how good is that, really? ), or you’re still involved as a mozillian, and well, then, you’re not different than other non-employees. Man facebook is awesome, just for their work on open datacentres and the opencompute project. As a member of mozilla IT, I feel that they really do their part in their own way in opening the web. They have their own internal needs, etc when it comes to privacy and policy, etc, but as with everything in the world, it is shades of grey. On the other hand, we definitely need to treat our alumni with more respect and have better relationships with them.